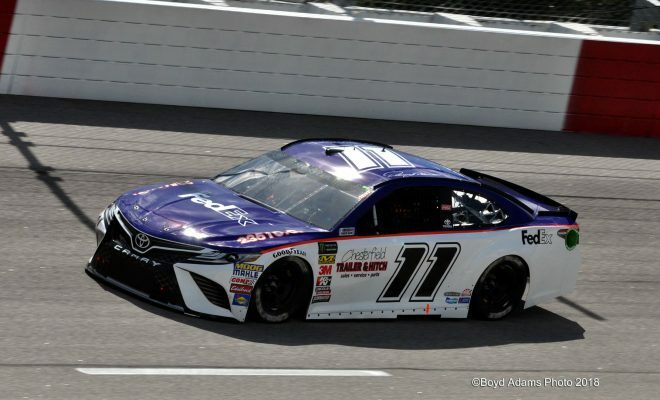 DARLINGTON, S.C. — Driving a car that mimics the paint scheme he drove on bull rings as a child, Denny Hamlin won the pole for the Bojangles Southern 500 from Darlington Raceway. Going with the throwback paint scheme, Chesterfield Trailer and Hitch, the Chesterfield, V.A. 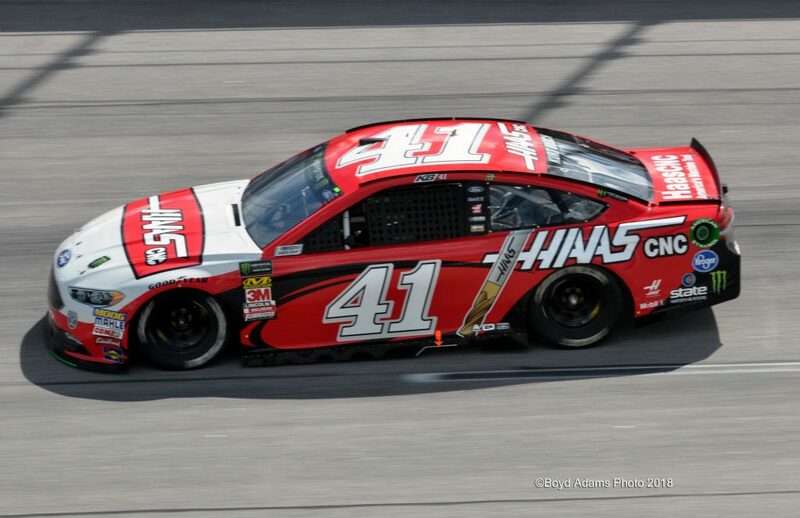 business that sponsored Hamlin as a child, is featured on the door panels of Hamlin’s Monster Energy NASCAR Cup Series car this weekend. The pole is the 120th for Joe Gibbs Racing, and 29th for Hamlin. 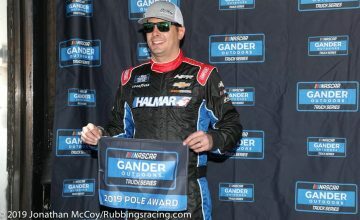 This is his first pole at Darlington Raceway. For Hamlin, winning the pole was significant because his team gets first selection of pit stalls. It gives him prime position to defend his win in last year’s Southern 500. Hamlin’s best lap averaged a speed of 173.571 mph. He was 0.16 mph faster than second place qualifier, Kyle Larson. Larson ran only one hot lap during qualifying. Would running one more lap have helped? In the first round of qualifying, Jeffrey Earnhardt spun his No. 96 Xtreme Concepts Toyota into the inside backstretch wall. His crash stopped the qualifying session with six minutes and nine seconds left in the first round. After a short clean-up the track returned to action. Later on, Earnhardt was cleared and released from the infield care center. The top-24 drivers advanced to the second round of qualifying. Ricky Stenhouse Jr. and Michael McDowell were the first two drivers to miss out. Stenhouse was on track when the time expired but was unable to post an improved lap time. Alex Bowman was fastest in the second round of qualifying. 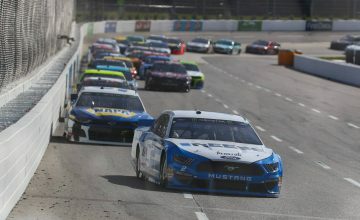 The first five drivers to miss the third and final round, consisting of twelve drivers were: Brad Keselowski, Paul Menard, Matt Kenseth, Daniel Suarez, and Clint Bowyer. 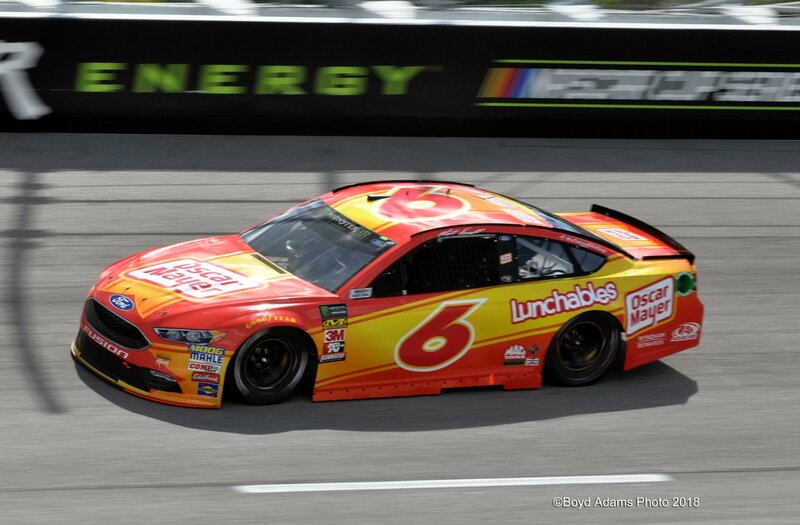 Replacing Trevor Bayne in the No. 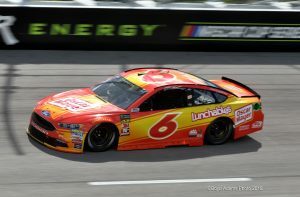 6 Oscar Meyer Ford, Matt Kenseth qualified 15th. He’ll start the Bojangles Southern 500 from the inside of the eighth row. Photo by Boyd Adams. Team Penske put one of its three teams into the final round of qualifying, Keselowski was 13th and Ryan Blaney was 21st. 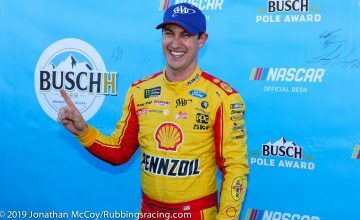 Their teammate, Joey Logano was fast enough to advance into the final round. He wound qualifying eighth. Three of Hendrick Motorsports four drivers placed inside the top-12. Bowman will start fourth, Byron 10th and Chase Elliott 11th.